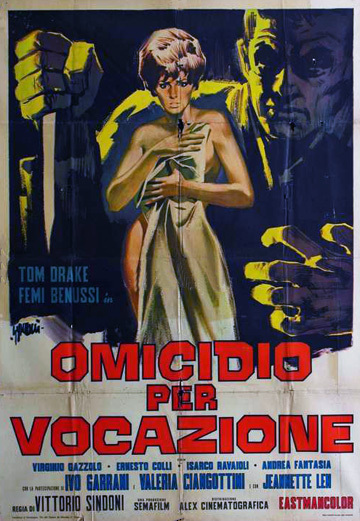 Vittorio Sindoni 1968 big screen directorial debut, Omicidio per vocazione (aka L’assassino ha le mani pulite and Deadly Inheritance for the English-language market), stars Tom Drake, Femi Benussi, Virgilio Gazzolo, and Ernesto Colli in an early example of a giallo film, with characteristic elements such as a mysterious serial killer, shocking violence (although restrained compared to 1970’s counterparts), a vulnerable victim in distress, and the expressive use of original music, which was composed and directed by Stefano Torossi. The story by Aldo Bruno, Romano Migliorini, and Sindoni concerns a hearing-impaired rail worker struck and killed by a train. 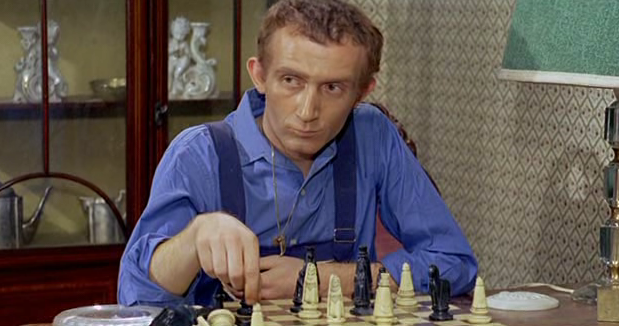 The old man’s unexpectedly large estate is left to an adopted son, Janot (played by Ernesto Colli). Simone (Femi Benussi) and her two sisters, Colette and Rosalie, are left out of the will. Suspects and family members in line for the sizable inheritance soon begin to disappear, leaving the the task of finding the killer to Inspector Greville, played by American actor Tom Drake. Femi Benussi’s character Simone is the family member closest to Janot other than the recently deceased father. Film fans know Benussi from later horror movies and thrillers, including Pier Paolo Pasolini’s Uccellacci (The Hawks and the Sparrows) (1966) and in Fernando Di Leo’s La mala ordina (The Italian Connection) (1972). Tom Drake is another familiar face, appearing in classic movies like Vincente Minnelli’s drama Meet Me In St Louis (1944) and Edward Dmytryk’s Western Warlock (1959), and later in the 1970s in popular TV programs like Marcus Welby, M.D. and Adam-12. It is Ernesto Colli, however, who steals the movie with his convincing portrayal of the mentally-challenged Janot, who must wait three years before he is able to inherit his father’s estate. Colli later went on to have a memorable role in I corpi presentano tracce di violenza carnale (Torso) (1973). Two years later, he was in L’uomo dagli occhiali a specchio (1975), a movie Sandro Brugnolini did the original soundtrack for–and which may be released in the near future. In 2009, Swedish record company Fin De Siècle Media released a limited edition 500-copy CD reissue of Omicidio per vocazione, again paired with È stato bello amarti, although this time the order was reversed. The deluxe gate-fold reissue is still available at online sites such as eBay worldwide and definitely worth seeking out. 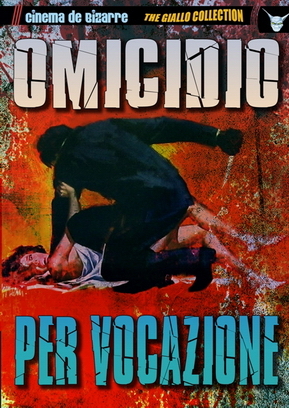 In fact, Stefano Torossi’s original soundtrack for Omicidio per vocazione, available in CD for the first time, is noted favorably in several reviews. In December 2012, a user on the film website imdb.com posted: “The best feature of the movie has to be the soundtrack though. 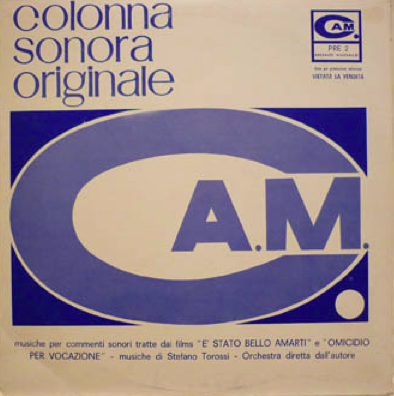 The music is composed by Stefano Torossi. 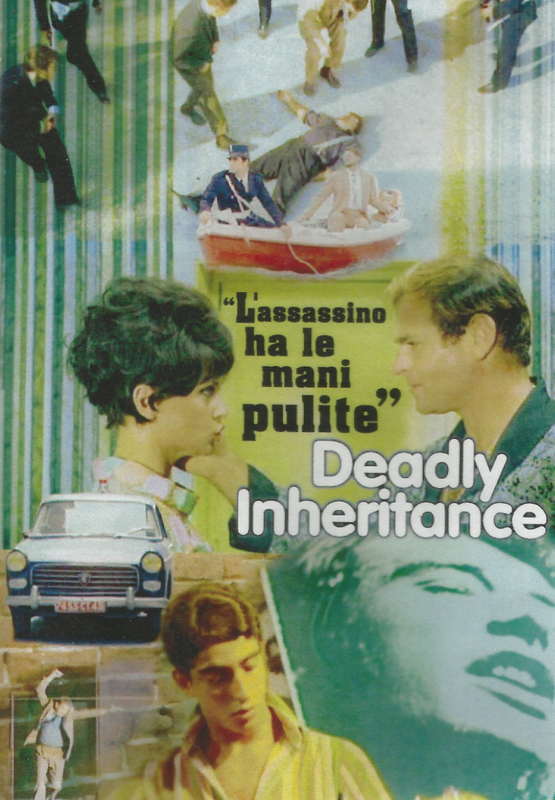 It’s varied and of a good standard throughout.” A reviewer on the giallo fever blog stated: “On the plus side Omicidio per vocazione / L’ Assassino ha le mani pulite / Deadly Inheritance film does feature an enjoyably trashy score from Stefano Torossi – the title music sounds like the Peter Gunn theme with kitchen sink percussion playing over it…” The giallo fever review posted in 2007 is HERE. Another review of Deadly Inheritance from the Permission To Kill site posted in 2011 is HERE. Omicidio per vocazione, under the title L’assassino ha le mani pulite, is currently available as a DVD from Italy’s Surf Video. A quick glance at eBay worldwide had five copies of the suspense thriller for sale. Note: Unlike at least one other official version that this author has seen with an English language track (posted on YouTube for a couple of months at the beginning of the year), the Surf Video version is Italian only and does not have subtitles. An English language version is available from www.modcinema.com, under the title Deadly Inheritance. The same outfit carries an English language version of Si puo’ fare molto con 7 donne (1971), sold under the English tite: You Can Do a Lot With 7 Women. These seem to be the only two films featuring Stefano Torossi soundtracks currently available in DVD. In 1969, Vittorio Sindoni directed Italiani! È severamente proibito servirsi della toilette durante le fermate (Italian! It is Strictly Forbidden To Use The Toilet During The Stops! ), his second film—he has done more than 40 for cinema and television into the 2010s. Stefano Torossi again composed and directed an original soundtrack. He also appeared on screen, the first of many appearances as an actor on film, TV, and as a host of a cartoon program. 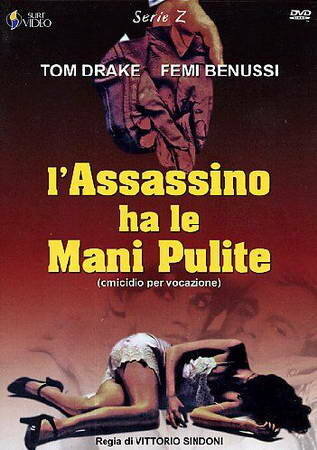 Posted on 19 August 2014, in Film Spotlight and tagged "Omicidio per vocazione (versione romantica)", "Omicidio per vocazione aka l’Assassino ha le mani pulite (Deadly Inheritance) (1968)", 60's Italian cinema, CAM Records, Ernesto Colli, Femi Benussi, Fin De Siècle, giallo film, Italian cinema, Ivo Garrani, L'assassino ha le mani pulite (Deadly Inheritance) 1968 film, Omicidio per vocazione OST (1968) CAM Records, Stefano Torossi, thriller film, Tom Drake, Virgilio Gazzolo, Vittorio Sindoni. Bookmark the permalink. Leave a comment.